This is the third year in a row that we've stayed at Surf Song and we recommend this place to everyone we talk to. 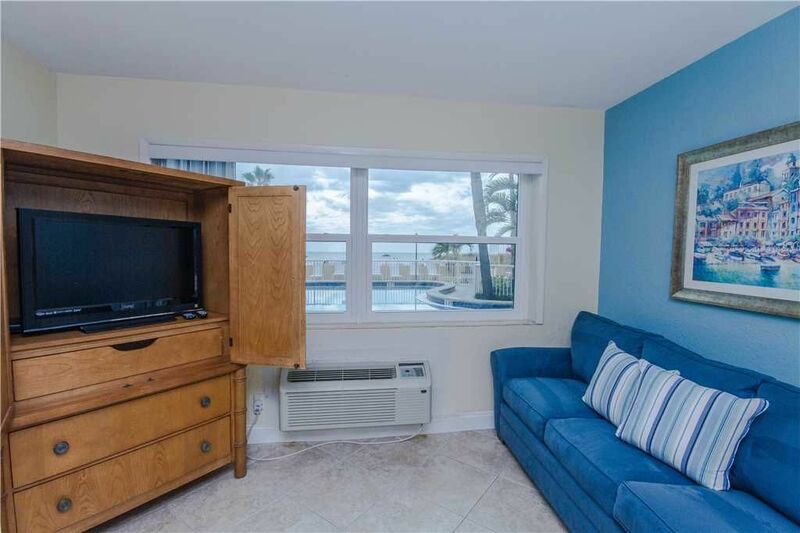 From the ease of selecting a room, the low prices and the perfect location to either just enjoy a nice clean (and not crowded) beach, or right across the street from John's Pass, Surf Song is the only place we'll stay when we're in the area. We are enjoying our stay however my sister, mother and brother in law are also here in Unit 119 and so far there have been 3 snakes in their unit that they have had to take care of. I hope that they will somehow be compensated for this problem. My mother is 82 and they scare her to death. King bed was very comfortable. Room was very small for the amount of furniture. My husband and I both require CPAP machines and there were no bedside tables to put them on so had to wedge a suitcase between the wall and bed for one, and move the sofa over to the bedside for the other one. There was only one electrical outlet on that side so had to get 2 extension cords to plug them in. There was a coffee pot and toaster on a small foyer table (no kitchen), but no outlet for them; moved the coffee pot to a small table where we could plug it in. A few kitchen items and utensils were supplied but there was no water supply except the bathroom sink which would have been unsanitary for washing dishes, so bought disposables. Bathroom sink had no counter top and the only mirror (small) in the room, making applying make-up and hair-styling difficult. Water in sink and toilet were slow-draining; tub was old and appeared stained. Tile floor was clean but felt gritty, like it was mopped without sweeping first. Pool was right outside the window so did not open blinds making the room dark unless lamp was on. The room was damp with the AC running so had to use the noisy dehumidifier. Killed 2 cockroaches. One of our worst experiences. Over the years of staying at Surf Song every visit is as great as the last one. We enjoy our time here. All the rooms we've stayed in have been wonderful. I always look forward to our next vacation here at Surf Song Resort. We had a great time here, after check in we never used the car again Reasonable price, close to everything and fantastic pool. We will stay here again!